The Big Wobble: Our Sun awakes: Another monster brewing on our Sun! Sunspot AR2699 doubles its size to more than 100,000 km across: X-Class flare potential? Our Sun awakes: Another monster brewing on our Sun! Sunspot AR2699 doubles its size to more than 100,000 km across: X-Class flare potential? 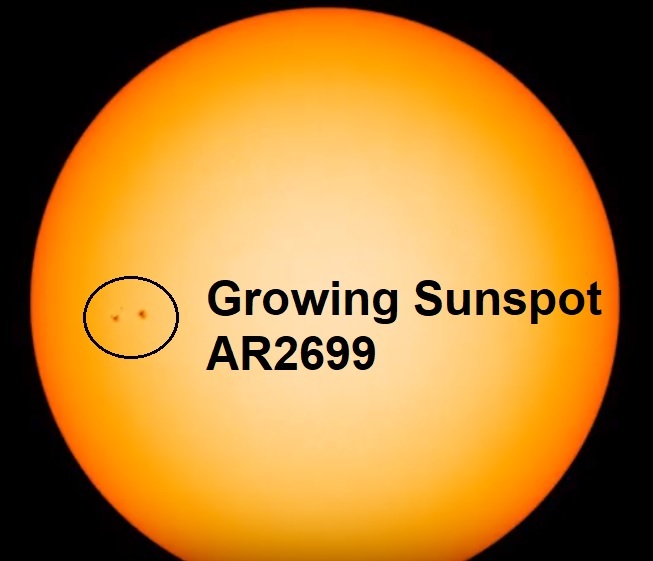 GROWING SUNSPOT: Sunspot AR2699 continues to grow, more than doubling in size since it appeared on Feb. 4th and is now stretching more than 100,000 km across the surface of the sun. According to Spaceweather.com, the sunspot has developed an unstable "beta-gamma" magnetic field that harbours energy for an M-class solar flares NOAA forecasters estimate a 15% chance of such explosions on Feb. 9th. With two primary dark cores larger than Earth and a scattering of moon-sized magnetic condensations stretching more than 100,000 km across the surface of the sun, AR2699 is an easy target for backyard solar telescopes. On the 27th of June, 2017, NASA announced a new Solar Minimum. Every 11 years sunspots fade away, this event is called a Solar Minimum and this is happening now with 2019, 2020, expected to be the quietest period, so Sunspot AR2699 is an exciting prospect. In September 2017, Sunspot AR2673 expanded more than 10-fold in a single day becoming one of the largest sunspots of the year. The behemoth sunspot continued to grow until BOOM! 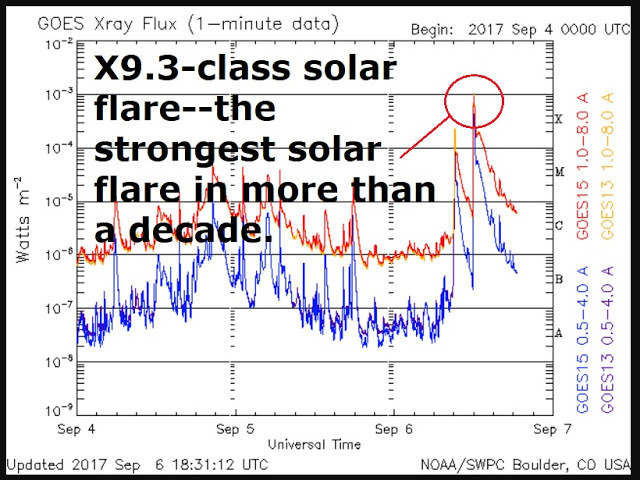 it released an X9.3-class solar flare--the strongest solar flare in more than a decade, see the NOAA graph below. Sunspot AR2673 released three more X-class flares before disappearing to the far side of the Sun. Apart from an isolated M-class flare in October 2017, our Sun has gone into slumber but is now awake, maybe, just maybe, Sunspot AR2699 could be about to produce some fireworks!